Boots-on-the-Ground Advice for Spirit-Empowered Parenting. In this fortifying ten-week study full of honesty, humor and keen insight, bestselling authors Bill and Beni Johnson give you the keys they used to parent their children successfully to become giant-killers in God's Kingdom. The Johnsons address many of the pressing issues parents face today, with the goal of helping you raise your children to step into their divine destinies with courage, uniquely positioned to represent God in the earth. an encouraging word from Bill and Beni at the start. ideas for how to invest in intentional parenting by using this guide. ten sessions of four lessons each that highlight and complement the book. questions to consider for personal reflection and growth after each lesson. video takeaways highlighting the main points of each video in the DVD set. a list of questions and answers from the bonus Q&A video. Here are the practical tools, Kingdom concepts and wisdom you need to raise giant-killers in your home--children empowered to make a difference not only in their lives, but in the world. 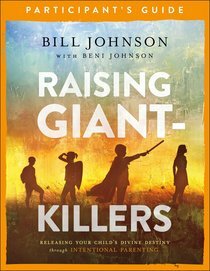 About "Raising Giant-Killers: Releasing Your Child's Divine Destiny Through Intentional Parenting (Participant's Guide)"
:With honesty, humor, and keen biblical insight, bestselling authors Bill and Beni Johnson help you discover the keys to successful parenting in God's kingdom. "Parents, we rule for the purpose of protection, but we also serve with the purpose of empowering," they write. "We want to release our children into their destiny--that's the privilege of parenting."